In the spirit of trying to do more for/with the Bolthole and based on some immensely productive conversations with people at the Weekender (and in the secluded dungeons of the Pit & Pendulum), I decided to have a crack at this exercise. We're going to be trying to write Space Marines! This came about because various people had different issues, ideas and tips for writing Space Marines. One of our number was tryinmg to get back to writing them, I rarely write them...So I felt the best way to go about it was to do this. Herein we will develop, submit and cross-critique our work, and then see what comes out of the mix. * A maximum of 2,500 words. * Use a Chapter that isn't First Founding, but has enough flavour that you won't simply be inventing too many facts or background. Good examples of this would include: MORTIFACTORS, BLOOD DRINKERS, NOVAMARINES. * Try and aim for a mix of character and action. What I figured we'd do is post our choice of Chapter in the thread; then post as and when we finish. Those taking part can then offer constructive criticism and feedback, and help each other to develop our ability and comprehension of writing Space Marines. Last edited by MalkyDel on Fri Dec 01, 2017 11:51 am, edited 13 times in total. Cheers for setting this up and I am definitely up for this! He was running, by the Throne he would not let them take what remained. 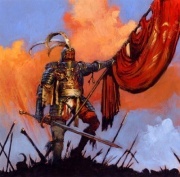 Hurons deception had been near perfect, the Lamenters, the Executioners, and his chapter the Mantis Warriors were swayed by the lies of a madman. They had learned the truth....and with it they had earned their fate. His name was Jeon Chol, sergeant, he had served for 200 glorious years, he had seen the enemies of man driven back and destroyed. now he was the last of his squad. They came in silence, no battle cries, no challenges for personal duels. He had fought them, even killed several but they kept coming, they showed no concern for their fallen. He heard civilians screaming in the distance, pleading for their lives. The bolter fire ended those pleas, they were actively killing everything they encountered. That had unnerved him, he expected such actions from the legions of the eye, but not from those who served the Throne. His pondering had cost him dearly, the explosion hit him from the side, his helmet cracked from the impact. He kept moving, the healing had begun, it would take time and he felt the shattered bones within his arm start to set. The blood pooling in his mouth hinted at internal damage. He needed to block out the pain, to focus on reaching any of his surviving kin. His Chapter was dying but something could still be salvaged. He had forgotten that the galaxy laughed at those with hope, and that would cost him dearly. The training ground were burning, Scouts and aspirants lay dead, some butchered beyond recognition. Grief and anger were at war within his soul, he had trained many of the dead, they were to have been his legacy to the Khagan. He saw it then, movement, one of them still lived. He rushed to the neophytes side, his wounds were serious but treatable. "Can you stand?" the question was ludicrous, the boy had lost too much blood, it was a miracle he was still alive. His lips moved, barely above a whisper "R..r..run" was all he managed to say before passing out. Chol suddenly understood, the boy was not a survivor......he was bait. More bolter fire erupted from the flames, the boy was pulped before he hit the ground. Chol knew he was hurt, his arm lay in front of him, his legs wouldn't respond. It took him a few moments to realize they were no longer attached. He was dying, and yet through the smoke and ash he could sense it, an alpha predator circling in for the kill. He emerged from the smoke, armor grey and blood stained. He was not an Astartes, not in the conventional sense, he was war given form. Chol saw the relic claws, absurd overkill yet perhaps that was entirely the point. The warrior regarded Chol with a fractional tilt of his head. The last thing Jeon Chol would see in his existence was an armored boot crushing his skull into the ground. Awareness came quickly, brought on by the heat and pain, that he was still functional was a gift of the Omnissiah. The thermal and energy reading already confirmed for him what he instinctively knew, his brothers were dead. The organic components of his form had suffered trauma though that had already begun to heal. His enhancements had saved him but were on the verge of system failure. He was Astartes, he knew no fear, though in his current condition the chances for survival were barely above 26%. Martellus crawled from the wreckage, his brothers remains had been scattered by the crash. The Thunderhawk would never be salvaged, the machine spirit was dead, even a soul forge reconstruction would not restore it. He enacted self-repair protocols they would take time to complete, and there would be pain. He was fortunate that what remained of his brothers armor would provide him the material to repair the damage, he knew that it was an act of desecration but he also knew that he needed to survive. Hours became days, days became weeks, his physical form had healed, the mechanical components had been repaired. He calculated that victory had been achieved by his chapter. It was a logical assessment as Typhon was still alive and not laid waste by the Hive Mind. His remaining brothers had not come for him, which meant they believed him slain. He bore them no ill will as based on the data at hand he should not have survived the destruction of his vehicle. He began to consider his options, Typhon was barely inhabited, the humans who called it home were little better than savages, though they made excellent recruiting stock they would lack the technology which would allow him to contact his chapter. His implanted memories flared to life "The communications relay..." He knew of it, left on Typhon long before the age of strife it had allowed for long range communications at a fraction of the time. He also knew that it was nowhere near his crash site and that travelling through the jungle alone would be tantamount to suicide. He took up the weapons and provisions that had remained. It saddened him that he could not salvage the chapters due, the loss of gene-seed would be regrettable but necessary. He began to move through the foliage, the native fauna sensed his presence, and retreated, the natural survival instincts overpowering their hunger. He knew there were worse threats deeper in the emerald hell he was about to enter. A week had passed, he had made excellent progress, only being forced to kill some of the larger xenoforms. He then picked up a faint smell in the air, blood, human blood. He picked up the pace, partly out of curiosity to what he would encounter. It was a village, or to be more precise the remains of one. Human remains decorated the landscape, the kills were still fresh, furthermore many of the suffered ruptured craniums and lacerations. Martellus began to sift through the implanted memories. "Tyranid Genus, Lictor, ambush predator, consumes the cerebral tissue of the target gaining insight into the prey." His mind was now racing through the speculative scenarios, he could continue to the relay, contact his brothers and leave this Throne forsaken rock......or he could avenge the mortals who had fallen to the xenos. He remembered when the chapter had taken him, he remembered learning why he was destined to fight, but strangely it was the words of the Magos that cemented his decision. "Humanity, though flawed, is the greatest species in our galaxy, think of how far we have come? think of the great achievements that mark entire worlds. Yet it is not merely our technology that grants us our innate place as the dominant life-form, it is our ability to come together, to fight those that would stand against us." The conversation had occurred 54 Terran standard years from that moment, Martellus knew that the Magos had been correct in his assessment, the Xenobreeds had encroached on the domains of the Emperor, and for that they would face the same fate as any other usurper....extinction. Martellus knew that the beast would still be hunting, he knew night would soon set, and that it would be nearly impossible to hunt the beast in the darkness, but there were other methods. He had gathered the bodies of the slain, and activated his micro-flamer. The smoke had begun to fill the now night sky, he stood before the flame scanning the shadows, he knew the beast would come, no matter how advanced it appeared it was separated from the Hive Mind. It was an animal....a dangerous animal to be sure, but one that could be bested. He sensed movement, his tracking systems attempted to lock onto the Lictor but he knew they would not be able to. He suddenly felt an impact in the back of his skull, the beast had snared him attempting the same horrific act that it had perpetrated on the mortal victims. Despite being caught of balance Martellus smiled "You're mine" as those words left his lips the servo arm took hold of the Lictors tongue. Martellus drew the two bolters he had taken from his fallen kin. His systems targeting array had locked onto every possible weak point on the xenos form. He did not hesitate and opened fire, each bolter round had connected the micro-detonations combined into a beautiful display. Martellus rushed forward, though heavily wounded the beast was still alive. He continued to fire even as he tackled the dying creature. he pulled the prehensile tongue from the back of his head. Despite his near death experience he chuckled, all those years ago on the red planet, all the enhancements he had made to his flesh he remembered the one that his Magos had been the most puzzled by. He had reinforced the back of his skulls with additional adamantium platting, when the Magos had asked why Martellus gave an honest response. "You'll never know when an opponent will manage to get behind you, I may as well be prepared for such an eventuality." While I can certainly appreciate your enthusiasm, it was intended to be an exercise in fresh work. I'm sure we can happily look over what you've submitted, but if you want to start with a fresh canvas that would be better . Also! I probably should have put in the intro post; try and avoid using existing characters. Personally, I'm thinking I might try Mortifactors. Gah there are so many Chapters to choose from I may need some time to work this out. The Technological lore of the Praetors of Orpheus is second only to that of the Adeptus Mechanicus. Many believe that the two are tied by more than shared service in the Emperor's name. But subsequent codexes have stressed instead their famed "disciplined approach to executing the Codex Astartes" with the 7th edition dex suggesting that they were too inflexible in the literal interpretation of a book written by a genius that covered all forms of imaginable warfare whilst the 8th makes it out as something that causes offence to their allies but also states the Praetors "operate like a perfectly calibrated engine of war" which rather means that these positions aren't contradictory. After all a sort of machine logic approach to running a Space Marine Chapter would seem like slavish devotion to the codex. But I'm not so sure about them now. Across the three codexes they appear twice but in a consistent manner. They favour thunderhawks over drop pods, are famous for their use of gunships of all varieties, they have some sort of structural aspect to their chapter called the "Talon Wing" which other chapters send their pilots to serve with to become better pilots. Probably the most free reign to do whatever personality I want for the astartes as the notable aspects are flying rather than personality bits with the chapter. In 2008 this chapter was known for being under strength after committing its entire force to assaulting an Eldar Craftworld. This got expanded, they exemplify the most stubborn and intractable qualities of Dorn (their Primarch) and are unwilling to accept defeat. This has them seeming daring if not reckless that never hesitates and excels at planetary subjugation. They also have a habit of losing lots of men, barely a dozen survivors out of three battle companies when they supported the Grey Knights, losing most of their 1st company attacking the Necron World Engine. So I think I have three rough things I can play with with these chapters. 1)A Story that squares away the Praetors technological base and ad mechness with their Whiter than White exemplary sons of Guilliman aspect somehow. An interesting theme but need to work out the characters and how to sell it still. 2)A Hawk Lords story, perhaps including a space marine from another chapter on secondment to the Talon Wing to create a comparison point and built in outsider view and possibly tension or conflict. 3)An Invaders story, possibly revolving around the updated codex having things about new units being drafted in from the reserve companies (making Companies bigger than 10 squads) and taking on new markings (I know, I know we all thought "isn't that how the chapters work anyway? Otherwise what is the point of "reserve companies" I don't know what to say). Built around the fact that their companies never stay full strength very long. Thoughts, feedback or whatever to help me come to a decision will be useful and if you want me to post up some of the colour text paragraphs of the chapters so you can have ideas yell and I'll do some at random. On an end game situation, I am presuming we'll get a judging thread set up and all those who enter (and any who don't but wish to) will have to submit some crit/opinions before saying what their top three stories are and we can then tally up the votes to see which is the best. I know I was going to wait for folks to weigh in and help me decide between the three ideas. But I have an Invaders story in my head now. Feel free to muse on the details shared on the other chapters. Also a good idea to focus on what writing about Space Marines really entails. I forgot who I had this conversation with - but you could choose to focus on their inhumanity as much as you could their humanity. The oft-quoted idea is that Space Marines entirely expect to die in battle. They don't get old, their skills don't fade, they don't retire or end up in a a back office job. What I think makes for really compelling writing about Space Marines is anything which focuses on both of these areas and that which showcases their similarities and differences to mere mortal man. I think I will look to continue the work I did on the Astral Knights in the recent competition, soon to be reposted in the fan-fiction section as a snap shot. I like the idea of the new Primaris marines seeking out what was left of the chapter who went off to find their end in glorious battle after the devastation of their chapter at the hands of the necrons. Plus, the "Lost Knights of Obsidia" sounds like an amazing 70's pro-rock concept album. Would Mantis Warriors be ok or do they have too much backstory? With Horus Heresy marines and their limited psycho-indoctrination we tend to see more human characters within the Legions even if they did't have normal human concerns or a normal human childhood. When looking at 40k marines (but not Primaris, as i'm not familiar with them just yet), I tend to get the impression from the lore that they not only have less humanity but that they are also so inhuman that they shouldn't work well as characters on a page. However, in most Black Library books with space marine POV characters, their character tends to fit somewhere between the extreme of a near robot killing machine and a human. Obviously, feel free to challange my premise on how the marines are represented in the lore, but, if you agree with me, do you feel that it is necessary to give space marines more character in the novels, than they should have, purely to make them work as protagonists? Are you sure you weren't at the weekender Rob? Everything you just said essentially came up in one of the seminars (Space Marine Conquests?). In terms of the Primaris an interesting observation raised was that most of them are waking up to a very different galaxy/world than the one they left, and what is the impact of this on them? I shall be writing a short for the Silver Skulls. I am tempted by the Storm Wardens, do you think that would be ok? Here is my Silver Skulls short, approx. 1029 words. Enjoy, and let me know what you think! The sharp, acrid tang of blood and battle-flame fill his mouth and nostrils, heightening his gene-enhanced senses as his wraith-form scours the battlefield for the next target. He revels in the kill, rejoicing as his purified weapons turn enemy to blood and bone-shrapnel. He can feel the recoil of his bolter and the swing of his chainsword, each blow biting hungrily into flesh and ceramite alike. Beside him, his brothers join in the slaughter, adding their weapons and voices to the battle-hymn. War is the sweetest music. In one swift moment, the dreamscape changes and he is locked in mortal combat with a devastating enemy. Blood-revelry turns to anger, frustration, and hate for his foe. He knows in moments he will be cast down into the blood and dirt of some far-flung world hanging on the edge of distant memory. Even in his dream-state, he can feel the pain stabbing through him like a million spears. He remembers falling. He remembers failure. He is left to die on the battlefield while his foe turns to engage a more worthy opponent, and he feels rage at having been so easily discarded. He is helpless and cannot rise. They have taken his legs. He is slipping out of consciousness, his wounds too great for his gene-enhanced physiology to properly clot and stem. He feels death swiftly approaching and prepares for its final embrace. He sees the faint outline of phantom figures suddenly swim into view through clouded sight. Ceramite-clad hands lift him and he is carried away from battle, an honour-guard for the fallen. He feels subtle pain, and then numbness, and then nothing. He is stirred from his deep slumber by a voice echoing faintly on the very edge of his consciousness. He is drawn slowly into wakefulness as his dreamscape fades back into memory, and he is made acutely aware of his surroundings. The voice again, louder this time, draws him ever closer to the light. When he speaks, it is not with his voice that he once had in life, but with the thunderous chorus of machines. Sensors reach out into a vast chamber and he feels the presence of others, twenty in all. Even blind, he can still see them – brothers all resplendent in the black, steel and burnished silver of his Chapter kneeling in a semi-circle upon the platform. A grinning skull stares blankly from each shoulder pauldron. They kneel before him in reverence, all but one. Full awareness takes hold and the warrior-corpse stirs in his life-cradle, his head turning slowly left then right as he lies suspended in amniotic fluid, mouthing silently. His machine-voice growls forth from his vox. +Which am I to be awoken?+ he inquires. There is no hesitation in the reply. Kyberos, Head-Taker, Ancient of the Silver Skulls Space Marine Chapter of the Second Founding and successor of the Ultramarines makes a ponderous sound, as like unto stone tumbling down a mountain-face. +Then the circumstance of my awakening is dire,+ he intones. Either side of him, Kyberos can sense the presence of other ancient warriors of his Chapter, each one likewise interred into life-cradles sustaining their ruined, battle-weary forms. They slumber still, and he envies them their sleep. Lord Commander Argentius of the Silver Skulls gazes up at the sarcophagus of the Leviathan-pattern dreadnought before him and speaks, his voice unwavering in the reply. Kyberos is silent a moment before answering, his immense form a towering memorial to war. Battle-rites and images of victorious conquest etched upon every inch of his reinforced plating. Scars and pitted metal pock-mark the war-machine’s chassis as testament to his unwavering service to the Chapter. From within the sarcophagus, Kyberos can feel his extremities as if they were organic, natural to him. From his left arm, quad storm cannons come online and cycle, feeding information into his neural interface. From his right, an enormous claw crackles with building energy as it is activated and he flexes it as he would muscle, the blades spinning upon a rotating joint. Targeting reticules paint those before him in a vibrant green glow, and he turns his attention once more to the Chapter Master. Now as before, Kyberos, Head-Taker strides into battle, his massive tread crushing the enemy beneath his armoured feet as he wades into the fray. Like his dreams before, his brothers charge beside him unleashing the Emperor’s Fury upon their hated foe. His Storm Cannon screams at his side as it unleashes a deadly fusillade of high-impact rounds that bite, detonate, and destroy those foolish enough to engage. In the near-distance, a towering form approaches, screaming its hatred to the sky in foul machine-noise and daemonic utterings. Its warp-tainted armour a corrupted testament to the machine it had once been. Kyberos replies to the challenge with a guttural roar that thunders across the battlefield, smashing a flaming Rhino APC aside with his power-claw and sending it spinning lethally away to crush several traitor marines unlucky enough to be caught in its trajectory as he charges forward. High-impact rounds smash against his reinforced plating as he nears the enemy, scoring deep wounds upon his chassis, but he ignores them as easily as rain. As he closes the gap, the Chaos dreadnought attempts to bring its melee weapon to bear, but Kyberos rips it free with his claw and discards it. The corrupted champion screams again, bleating its name in the face of its murderer. Kyberos replies by punching his claws into the face-plate of the tainted sarcophagus and twisting hard, ripping it clear of its armoured mount and killing the occupant instantly before discarding its remains. As Kyberos exclaims to the heavens, his victorious roar is echoed back by his brothers as he thunders onward to meet the next foe, their voices once more adding harmony to the song of battle. Razhbad wrote: I am tempted by the Storm Wardens, do you think that would be ok?